This manufacturer has expired. Here is other Tile you might be interested. the goods will be ready within 15 days after receipt of 30% deposit,the balance will be paid before loading. Located at Shiwan, Foshan, Guangdong, 1st China Ceramics Town, Aijia Ceramics is a large-sized, modernized ceramic production enterprise for wall & floor tiles. FOSHAN AI JIA CERAMICS Co., Ltd. Imports from ltaly latest ceramic production facilities, adopts globally most advanced production process as well as managerial method; It hires for a rather long period many experts and technical consultants at home and abroad and possesses a punch of professional personnel. The company regards "Human Oriented, Service foremost" as managerial spirit, passing and adopting ISO9001: 2000 International Quality System Certification for production, products being in line with GB/T4100.1-1999 standardization as well as GB/T4100.5-1999 standardization. 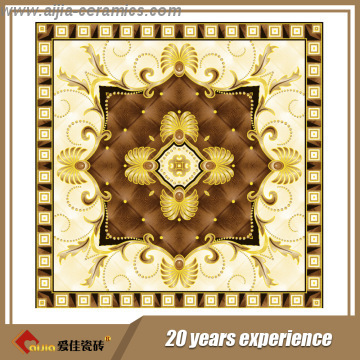 Series products as totally-vitrified polished tiles, rustic full body tiles, interior wall tiles produced by Aijia Ceramics are all compliant with national GB6566-2000 requirements, category A, international ISO14000 Environment Standa rdization System Management Certification, free for production, sales as well as utilization. Recently Aijia Ceramics has been granted as China Famous Brand, Qualified products inspected by National Authorization and other national honors. Aijia Ceramics is quite popular in national cities, and it even exports to Europe, South America, Middle East, South East Asia and other countries and regions, accepted and praised by users at home and abroad. For future development, we will try our best for research and development to produce more adorable products to end-users, creating the myth as well as the dream that Aijia Ceramics makes you like your house more and more.